I briefly mentioned tteokbokki in my pocha post. Meaning rice cake stir-fry, tteokbokki is one of Koreans’ favorite snack foods. Being a comfort food for young and old alike, you can find it almost anywhere in all kinds of flavor: spicy, seafood, black bean, cheese, curry, soy sauce, ramyeon, fried, etc. These days my favorite tteokbokki flavor is “carbonara.” I don’t usually like “fusion cuisine,” but when I tried carbonara tteokbokki, I wanted to pat on the back of the person who ever thought of this marriage. 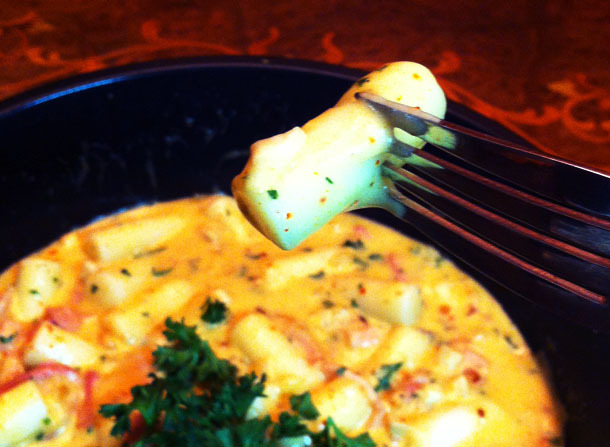 This creamy, soft, and chewy snack is a pleasant deviation from the usual spicy tteokbokki. For the purists out there who think it’s blasphemous to use milk or cream in carbonara, I’ll call this dish a “cream sauce tteokbokki.” You can add a little gochujang (Korean chili paste) and hot pepper flakes to make it tiny bit spicy like mine, or you can just enjoy it mild and white. It tastes similar to cream sauce pasta except with rice cakes. So the next time you get tired of pasta, try substituting it with rice cakes. 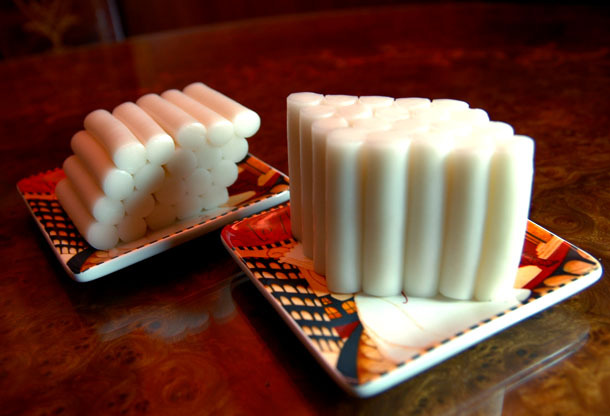 You can buy garaetteok (tube shaped rice cake) in most Korean markets. If you’re using frozen rice cakes, you have to immerse them in cold water until they are thawed. But if you’re lucky enough to find fresh ones, you can just use them as they are. I developed this recipe with my mom and it’s made with low fat milk because we don’t drink whole milk, but you are more than welcome to use whole milk or cream for richer taste. But even without extra fat, it tastes reasonably creamy. Soak rice cakes in cold water until they’re soft if they are frozen. You can skip this part if you’re using fresh rice cakes. In a large skillet, cook finely chopped onion and garlic in olive oil. Then add pancetta and cook until golden. Mix flour into milk to thicken it. (You can go without flour if you’re using cream or whole milk.) Pour the milk mixture into the skillet. Put mushrooms and rice cakes, some parsley, parmesan cheese, and if you want, gochujang and red pepper flakes. Simmer until it becomes creamy. Add more milk if it’s too thick. Add an egg if you want silkier texture. Season with salt and pepper as desired. 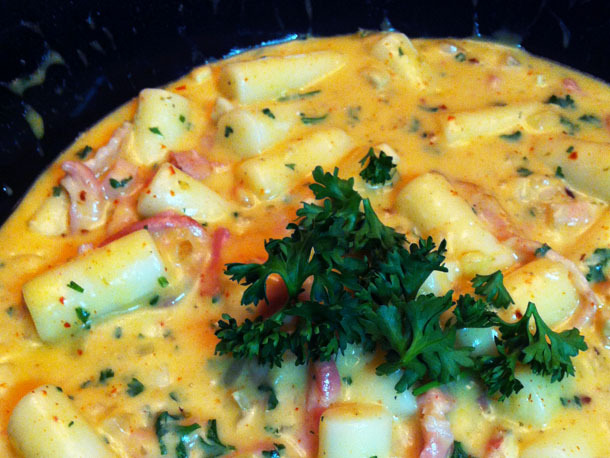 This entry was posted in Seoul, Taste and tagged food, fusion, Korea, recipes, rice cake, Seoul, tteokbokki. Oh drool! I want to try this immediately! AW! This is so wonderfully modern Korea! I think a pinch of nutmeg would go really nicely with it since the sauce base is more or less a bechamel. Man, I miss Korea! It makes me happy to meet a fellow tteokbokki lover! I’m glad you and your dad enjoyed it! Adding green chili peppers sounds really good. I gotta try it like next time. Thank you for your comment!